RUSH: We have the Speaker of the House, Paul Ryan, joining us for a few minutes here to exult and to explain the future with now the tax cut having passed both the House and Senate. What happens next, Mr. Speaker? When does this actually go into effect, and how will people first notice it? SPEAKER RYAN: Hey, Rush, longtime listener, fourth time caller. RUSH: Congratulations, by the way. RUSH: This is a big, big deal for you all, a testament to stick-to-itiveness. SPEAKER RYAN: It is. Yeah. We’ve been pushing this thing. I mean, I first met you when I was working for Bill Bennett and Jack Kemp and we were pushing this stuff back in those days. SPEAKER RYAN: Yeah. This has been a long time coming. We’ve been pushing this rock up the hill for years. I’m so excited we finally got here. It’s a big, big deal. So many conservative wins in this bill. I mean, more than just tax reform. We got rid of the individual mandate. Remember you asked me about that the last time we talked. SPEAKER RYAN: That’s in here. We got ANWR. We’ve been working on trying to open up ANWR for drilling for decades. That’s in here, which is really gonna help us with our energy independence agenda, not to mention the historical tax cut and tax reform that we’ve got here. So it starts, to answer your question, January 1, 2018. RUSH: So in the first pay period following January 1 people will notice changes in their withholding? SPEAKER RYAN: Yeah. So what we anticipate, ’cause we’ve been working with the Treasury department on that, the president and I spoke about this yesterday, is in February, ’cause they’re working on doing that, we think in February we can get the IRS to change withholding so that they take less money out of people’s paychecks in the first place and employers also can put more money in paychecks. So we believe we can get the Treasury department — this is the administration’s job, they’re working on this — to get withholding tables to reflect this tax cut starting in February. RUSH: — by February, is withholding tables. RUSH: Explain to me, since I brought this up earlier and before I branch off to other things, what is the practical meaning now or the practical application of the individual mandate being removed? I know that’s a large part of the guts of Obamacare, but what’s that going to mean to John Q. and Mary Citizen going forward? SPEAKER RYAN: It means you do not have to buy what the government says you have to buy. The individual mandate is a law that says you have to buy Obamacare insurance if you’re in the individual market, and if you don’t, you’re gonna pay a tax as a penalty if you don’t buy that, so that is removed and repealed. So you don’t pay this penalty; you don’t pay this tax; you don’t pay it at all, so we’re not gonna force you to buy something you don’t want to buy. You get to buy what you want to buy without a penalty. RUSH: Is this, in your mind, does this move forward any kind of a timetable on dealing with health care as an issue? I don’t want to say repeal and replace Obamacare, but this is a large part of Obamacare gone now. SPEAKER RYAN: It is. Yeah, you’re pulling at basically the biggest string of Obamacare. So by pulling this out, we’re basically taking away the core architecture of Obamacare. And we believe that gives us the ability to go back and address these other issues. What we really want to do is give states the ability to set up their own insurance markets so that they can get premiums down. My own state of Wisconsin, if we can go back to setting up risk pools like many states had where you can help people with catastrophic illnesses get affordable coverage, you can actually dramatically lower everyone else’s premiums. That’s the kind of reforms that we’re talking about, that we want to see done, and getting rid of this individual mandate, we believe, will help us get there. 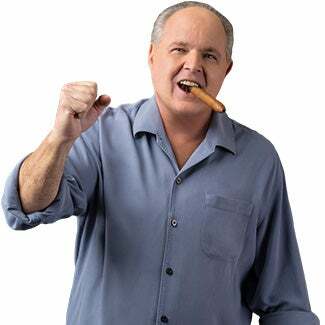 RUSH: — improve people’s standard of living, and I don’t think it’s all known yet. I don’t think it’s all been accurately spelled out. I think that’s why your buddies Pelosi and Chuck Schumer are in such a panic trying to mischaracterize this, because they know how effective this was back in the 1980s and what a boom that caused. They know that this can do the same thing. And you throw in gutting the Obamacare mandate, that’s gonna cause action to be necessary to fix what’s wrong with health care. And now you’ve got the wall, you’ve got immigration. You guys are on a roll, it appears. SPEAKER RYAN: So it’s exactly how we see it. We see it the exact same way you just described it. In the House, as you know, we’ve been rocking and rolling, we’ve been passing everything. We passed funding for the wall back in spring in the House, but we’ve got a Senate that we have to deal with that has different rules than we do, they move a little more slowly. But you gotta give it to ’em; they totally stepped it up here, got it done. We’re going down to the White House in a few hours to do an event with the president ’cause we just passed this thing like 20 minutes ago, the second time around in the House, so it’s done, it’s on its way to the president right now. I’ve gotta sign this thing in a few minutes or a few hours to get this bill down to the president’s desk. So we’re excited about it. This is happening, and we are on a roll, like you say. I tell people, go to FairAndSimple.gop. Because you’ll see all that this does. If you have children, this doubles your per-child tax credit from a thousand to $2,000. If you’re a taxpayer, your tax rates go down no matter who you are. 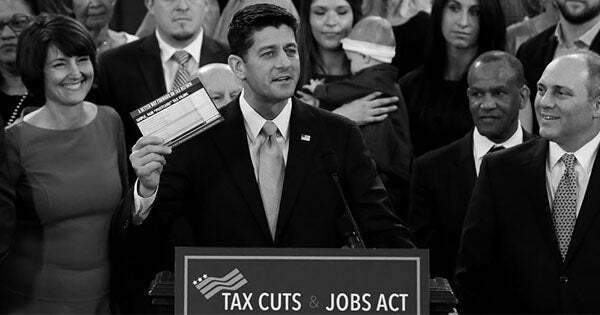 We double the standard deduction so that almost 90% of Americans will still, under our earlier version and this version, they’ll be able to fill out their taxes on a form the size of a postcard. That is radical simplification of the tax code and it dramatically diminishes the power of the Internal Revenue Service. So many conservative principles were advanced here, not to mention the individual mandate, not to mention oil and gas independence by getting the oil out of Alaska that’s been locked up there for years. We’re very excited about this. And I want to thank you, Rush, for helping us get there, helping get this message out. And I want to thank your listeners. Conservative grassroots activists have been staying with us and keeping us on point and supporting us while we go through this in spite of the liberal and the media onslaught that has confused people about what this bill actually does. RUSH: Well, let me repeat something. I appreciate that, but I really am serious. I think this bill has more potential to radically alter, for the good, the United States economy and draw such a contrast of what this economy has been the last eight, and maybe even 16 years. This has the potential to unlock things that people don’t yet know will be unlocked. Unlock more growth and revenue being produced, created, sent to Washington in the form of new taxpayers and new tax revenue. I think we’re on the precipice here. And you didn’t talk about the corporate rate, and I want to ask you about that only because I’m getting slammed here with seminar callers who are trying to convey a message that you guys, by cutting the corporate tax rate here, are busting the budget, you’re breaking the deficit, you’re adding to the national debt. And of course corporations aren’t gonna give anybody any money like Savannah Guthrie tried to do to you today. RUSH: “You’re living in a fantasy world, Mr. Speaker. You think corporations are actually gonna grow? You think they’re actually gonna hire people?” This is a woman who lived in the fantasy world that Obamacare was gonna lower everybody’s premiums, and now she is questioning you about it. SPEAKER RYAN: Yeah. I was there, I actually got that. And I was wondering to myself, you wonder why people are confused about what this bill does. SPEAKER RYAN: So, look. I mean, the corporate rate right now today, it’s 35%. On New Year’s Day it’s gonna be 21%. You know what it is in the industrialized world on average? Twenty-two and a half percent. We’ve been hitting our corporations harder with taxes than any other country in the industrialized world. RUSH: We should be because the left says corporations kill their customers and don’t want to help anybody and they don’t give anybody raises or health insurance or any of that. Corporations ought to be made to suffer. That’s what the left has got people believing. SPEAKER RYAN: That is what they’ve got people believing. Guess what they’re doing? They’re pushing them out of this country. The companies have been inverting, becoming foreign companies, they’ve been bought by foreign companies. They’re moving jobs overseas. I talked to the guy who runs Intel, huge corporation, microprocessors, 50,000 employees in America. Under this current code that occurs before New Year’s Day, they would have saved $2 billion in taxes over a 10-year period per factory if they just moved ’em overseas. That’s what the tax code was doing to American businesses. It was discouraging growing things in America, it was discouraging investing in America. We completely reversed that with this bill. It now pays to stay in America. It now makes sense to make things in America. And if you’re fortunate enough to be big enough to sell something overseas, now you can bring your money back home and reinvest it in this economy. And we have $3 trillion of cash that is trapped overseas that could not come back in this economy because of these goofy tax laws. We fixed all of that. And so now it makes sense to be an American company, it makes sense to make things in America. And if you sell something overseas, bring the money back, you can do it without a penalty. That’s gonna be good for growth. That’s good for America. RUSH: Well, what do you say to people who are afraid that the corporate tax rate is gonna end up adding to the deficit? How do you deal with that? SPEAKER RYAN: We were gonna lose corporations if we didn’t do this. My own home state of Wisconsin, the biggest publicly traded company we used to have headquartered in Milwaukee was Johnson Controls. The thermostat at the EIB is probably a Johnson Controls thermostat. They are now an Irish company. Why? Because the Ireland tax laws are better than the U.S. tax laws, for now. And so this was happening all across the country, U.S. companies were leaving because of taxes. So literally we’re gonna stop the bleeding of U.S. companies leaving. That’s number one. Number two, we are encouraging companies to stay and invest and grow here. That will create more jobs, that creates higher wages, that creates higher tax revenue. So of all the tax cuts that are in this bill, the one that has the biggest bang for economic buck is going to be the corporate tax rate reduction. You ought to have Art Laffer come on your show and tell you about how this works because he has been proven right over and over again. SPEAKER RYAN: I think that’s right. RUSH: — that it’s out to hurt people, that it’s out to screw people, out to kill their customers and so forth. Hey, you said you’re going to the White House for a signing ceremony. I understand the decorations this year are just awesome. SPEAKER RYAN: You know, I’ve been over there twice, three times since they put that stuff up. It’s really something else. Melania did it all. It’s beautiful. I’ve been down there many times. This is the best I’ve ever seen. The president had us over the other day for a movie, Darkest Hour. It’s a great movie, by the way. I’m a big Churchill fan. You probably are as well. SPEAKER RYAN: Yeah, it’s a really good movie. RUSH: — in my formerly nicotine-stained fingers on Blu-ray. I’ll bet you guys didn’t watch it in Blu-ray. SPEAKER RYAN: I have no idea. RUSH: The decorations in my house are pretty cool too. 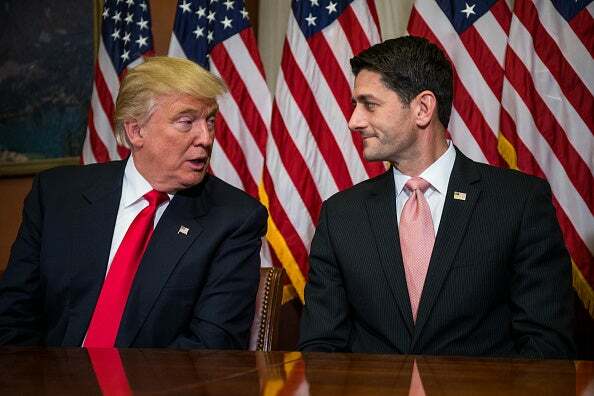 SPEAKER RYAN: We have a movie theater in the White House and president had us over there so we watched the movie, you know, with the president. And then he gave a tour of all the Christmas stuff. It’s really something. RUSH: Really, the president invited you guys up to see the decorations and watch the movie? SPEAKER RYAN: Yeah, just a couple days ago. 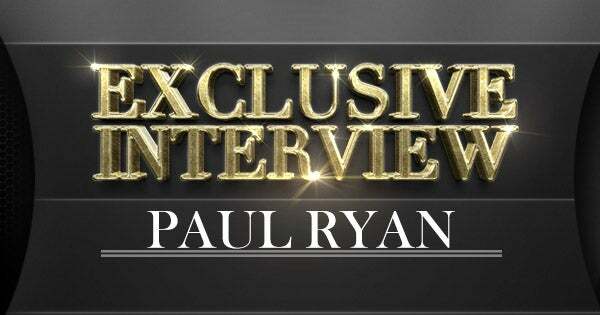 RUSH: — getting rid of that Obamacare mandate, the guts to cut the corporate rate. What about capital gains? Does that change at all in this? SPEAKER RYAN: No, it doesn’t. That was one of the casualties of the failure to repeal all of Obamacare. This is a big piece of Obamacare, but not the taxes. And so we’re gonna just have to get back at that later on. RUSH: Well, it’s not punitive as it is. SPEAKER RYAN: No. It’s 23.8 effectively, it’s 20% statutorily. Meaning, it’s not as high as it used to be, but we would love to get it lower. RUSH: Well, congratulations. Thanks for your time here. Appreciate it. SPEAKER RYAN: Thanks so much, Rush. Merry Christmas.